This didgeridoo was made especially for the exposition “Vormgevers in Hout” at Fort bij Vechten, last weekend (see: http://www.vormgeversinhout.nl/index.html ) This exposition shows the work of more than 50 craftsmen, chairbuilders, carpenters, greenwood workers and artists… My contribution is handmade didgeridoo’s from native trees. WOW, that is some beautiful wood! Would love to have heard it played. Oh my golly – stunning color variations and patterns and a musical instrument to boot. That looks amazing. I watched the videos. Wish I had one, not that I could play it, but it would be fun to try. Wow, that is some beautiful wood. Very nice horn! Very interesting sound. and nice project, how do you hollow the timber. 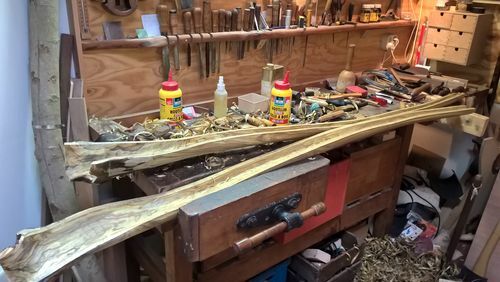 The way to hollow the timber is to cut the tree in halves, aka the sandwich-method.. After hollowing out with gouges you glue it up and clamp it… the next phase is to shave and sand it.. 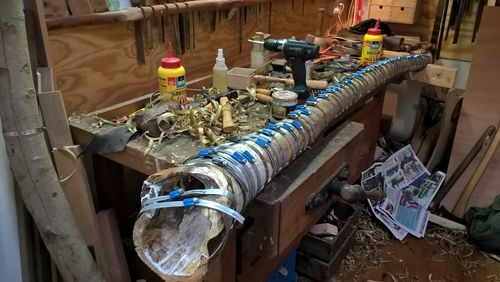 I love the sounds the didgeridoo makes as it is unique, just like your work! Beautiful piece of art, craftsmanship, and music! Beautiful work! Do you saw it by hand? I would imagine you would want as organic a line as possible. I also imagine that however you do it it must be exhausting.